Now that the King v. Burwell case is over I was curious whether both sides would find common ground on meaningful health care reforms. I was surprised to hear that Kathleen Sebelius says the law is working as intended and we should use this new opportunity to build on its early success. She is not alone. Sara Rosenbaum provided this list of health care reforms in the article, Post-King: Moving Forward In A New Normal. Six Problems With The ACA That Aren’t Going Away. It is interesting that neither side talks about the cost of health care for the middle class and the fact that the ACA has made health insurance unaffordable for unsubsidized people. In an ironic twist of fate the Affordable Care Act very existence depends on convincing these healthy, unsubsidized, middle class people to purchase health insurance from the exchange. 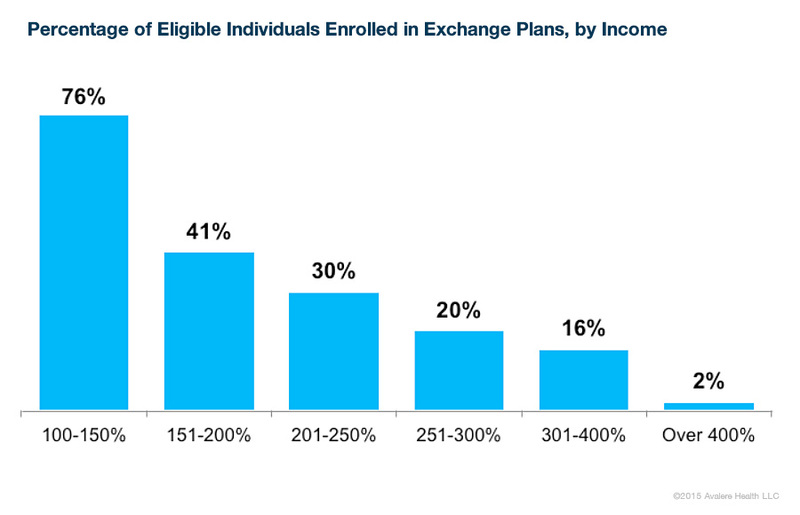 When you look at the report from Avalere Health, Exchanges Struggle to Enroll Consumers as Income Increases, it is easy to anticipate a death spiral in the exchanges if only 2% of the eligible people with income over 400% over the federal poverty limit are enrolled in the exchanges. The problem for ACA supporters is no longer politics but math. As I wrote in a previous post the cost of health insurance from the exchange versus my grandfathered plan is a very strong incentive for me to keep my existing health insurance. Perversely if my health insurance is not grandfathered for another year, my second best choice is to go without health insurance since I am exempt from the individual mandate because “health insurance from the exchange is not affordable”. Everything is in place for the exchanges to fail and the ACA supporters say the law is working as intended. I guess we have to break it before we can fix it. ← Did The Greek People Just Say No To Kicking The Can Down The Road?